Her new book seems to be about technology, but it is actually about what (and whom) technology leaves out. Those dumb debates keep happening: Is the Internet good or bad for activists? Does Twitter cause revolutions or not? 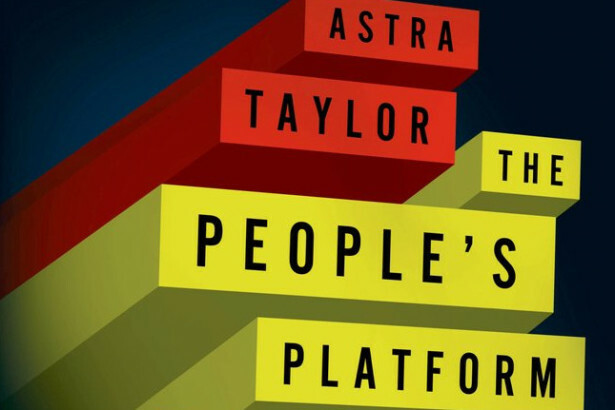 We know they’re dumb, but we keep having them — which is why Astra Taylor’s new book, The People’s Platform: Taking Back Power and Culture in the Digital Age, is so welcome. The People’s Platform seems to be about technology, and you should read it if you’re interested in technology, but it is actually about what (and whom) technology leaves out. It is about putting technology in its place — by confronting the increasing tendency to cherish freedom of information over the freedom of workers to organize, by refusing to celebrate digital “disruptions” when the cost is paid by the most vulnerable people among us, by questioning the tendency among activists to judge their impact by retweets and likes. Astra Taylor grew up unschooled, and she has been learning by doing in public ever since. She created two films featuring leading political philosophers, Zizek! and Examined Life. She helped produce a print gazette for Occupy Wall Street and co-edited the book that came out of it; through Occupy’s Rolling Jubilee campaign, she played a key role in stirring a much-needed national discussion about debt resistance. We caught up to discuss her new book while she’s on the road with the band Neutral Milk Hotel. As you were writing this book, you were in the midst of activism of your own, including the social media-driven Rolling Jubilee campaign. How did that organizing spur your writing? I wish organizing had spurred it — more like derailed! The book was turned in long past the official due date because I got so swept up in Occupy Wall Street, which eventually led to the Rolling Jubilee campaign — a project that is still ongoing. For those who haven’t heard of it, the Rolling Jubilee buys debts for pennies of the dollar on the secondary market, but instead of collecting it we abolish it. The campaign was indeed driven by social media, though we always envisioned it as one small part of a broader organizing strategy. Our aim was to raise $50,000 in online donations to abolish $1 million of medical debt in order to spread awareness about the shadowy workings of the secondary debt market and the inequity of debt-financing goods that should be publicly provided. However, the campaign went viral before the curtain was even lifted, in part because a famous person shared the announcement on Tumblr. We raised almost $700,000. Through Occupy and the Rolling Jubilee, some of the shortcomings of social media organizing became even more apparent to me than they already were. Social media is good at amplifying spectacles, but spectacles don’t necessarily amass power. They can be helpful for raising awareness about a cause or shifting the conversation, but there needs to be something left in the wake when the public’s attention inevitably moves on. There’s a real problem with how to capture attention and build on it — that’s one challenge that has kept my comrades in Strike Debt and the Rolling Jubilee and me up at night. It sounds like letting the Rolling Jubilee derail you might have been a good thing for the book. You’re absolutely correct — when I did return to the book, the experience of Occupy and the Jubilee suffused my thinking. I have a deeper sense of what a tremendous challenge organizing for economic justice is, and how much power the forces we are up against possess, and how committed they are to winning at any cost. Also, everything is so much more complicated from the ground. It’s easy to stand on the margins and criticize not just the 1 percent but activists and organizers or the left in general and say they should be doing x, y or z. But when you are actually trying to put theory to practice, it is really tough going — way harder than writing a book, in my opinion. So I tried to bring a little bit of that humility, that recognition of the gnarly complexities of practicing what one preaches, to the writing process. At some point in the press releases I noticed the subtitle of the book changed from being about “digital delusions” to “taking back power.” Why? What capacity do you think we have for taking back power online? That “digital delusions” phrase wasn’t one I came up with. I always wanted something more positive, but I couldn’t think of anything. Even the current subtitle was someone else’s suggestion. So much of the mainstream conversation about the Internet is really binary: It’s good or bad, it’s making us smart or stupid, it will democratize everything or else it’s just one big government spying apparatus that will bring about our ruin. One thing I appreciated about Occupy — and it’s a spirit I tried to carry into the book — was the combination of tech savvy and an emphasis on connecting through other channels, in public spaces, face-to-face. Every encampment had both a devoted crew of livestreamers and a wonderful library full of print books. There was a general recognition that these realms augment and complement each other, that any division between Internet activism and real-world activism is spurious. Noticing that fact about Occupy was heartening to me, too. Part of what makes a healthy movement, perhaps, is one willing to use a wide range of methods to spread its message, because the message matters more to it than the methods. We need to use every tool at our disposal in the fight to make our society more deeply democratic. That’s why “delusions” was not a word I felt conveyed the essence of my project. There has been a lot of youthful energy spent lately on activism for issues like “Internet freedom” and net neutrality. Do you think this is energy well spent, or should activists be focusing more on offline issues, such as labor struggles or environmental justice? In general I’m entirely supportive of those efforts, even if I think “Internet freedom” is a bit vague and mealy-mouthed and tainted by Hillary Clinton double-speak. That said, it’s a frame that has caught on, which means it’s something to build on, and that is far better than nothing at all. The fight for net neutrality is a really urgent and essential one. I’d like to see a more explicitly progressive dimension added to both campaigns. Internet freedom for whom? To what end? Freedom too often ends up meaning “free market,” a completely unregulated and corporate-dominated space. We need to move the conversation beyond just talk of a “free and open” Web. Right now Internet-freedom campaigns emphasize how essential the Internet is to innovation and competition. The private sector’s concerns take precedence over a public-good argument, and there’s scant attention to social inequity. The fights for Internet freedom and network neutrality, and even against laws like SOPA and PIPA, are all areas where the interests of the public and of large technology firms are generally compatible. Explicitly progressive causes — battles against consolidation, commercialization, unfair labor practices, advertiser-driven privacy violations, gentrification in cities affected by tech, the lack of diversity — that push back against business interests are a harder sell, but are really crucial. There are some encouraging signs these issues are gaining traction. How has the process of writing the book changed how you use technology, both as a consumer and as an activist? Writing this book forced me to plug in to the flood of tech news, which isn’t something I would otherwise do, at least not to such an intense degree. There’s a bias toward the present built into a lot of the sites and platforms we use — the newest post or comment is generally most prominent — and that’s not always useful. My philosophy films, in stark contrast, were about less timely and more timeless concerns, so that was a major shift — just having to keep up with this rapidly changing landscape was a full-time job. Occupy also made me more alert to the news and to conversations on social media; political work can be very reactive and in-the-moment. So I had these two projects that were turning me into someone who was constantly connected and paying attention, always “on.” I’m looking forward to taking a step back now that the book is done and the Rolling Jubilee is winding down. Honestly, I think that will be good for my thinking and writing, and also my organizing. On the latter front, I want to have a hand in creating associations and institutions that take the long view, that can transcend individual members and outlast short-lived street protests. As a consumer, I now have a paid email provider, since “free” services are anything but; we pay with our privacy and personal data. The problem with this model is privacy will probably become the equivalent of a luxury good, one only available to those who can afford it — yet another arena for social justice-focused tech campaigning. Is there one warning you’d emphasize for activists interested in using the Internet as a tool for organizing? Let’s bracket concerns about surveillance — that’s a widely covered and complicated issue, and while it’s outrageous and horrible what the government and giant tech companies are doing, and I’m hugely impressed with the efforts of Edward Snowden, Glenn Greenwald and Laura Poitras, I will say that avoiding surveillance is not my number one concern as an activist. My main warning for activists is to not be misled by digital metrics, by retweets and reblogs and likes and views — which is harder than it sounds. Again, I think the real challenge is institution-building and taking the long view, though of course new technologies can be employed in all sorts of exciting ways to help us do this. For example, right now the Rolling Jubilee team is talking about building an organization, a kind of union, for debtors. Tech will be a big part of this potential enterprise, including a website that gathers people’s personal and financial data, online forums and networks for members to connect with one another, social media to communicate with a wider public and so on. But our emphasis is not on the tech tools. It’s all about the human beings and the political strategy. The aim is to build something that is outside the attention economy, that doesn’t need to be in the Internet limelight right this second to have a major impact down the road.